For Green Chip Stocks last week, I explored some insights about complex systems presented at the 2009 ASPO-USA Peak Oil Conference, including the interdependencies of energy, food, and water. One of the more interesting themes that emerged from this year’s ASPO peak oil conference was the problems of maintaining complex systems, and the role that energy plays in them. Commercial agriculture consumes 10.3 quads (quadrillion BTUs) of primary energy in order to produce 1.4 quads of food energy. The inputs are mainly fossil fuels used in running tractors, producing artificial fertilizers, producing seeds, trucking, refrigeration, processing, freezing and cooking. Commercial agriculture not only depletes non-renewable resources and degrades soil, air, and water, but it also releases 5 billion pounds of harmful chemicals and massive amounts of greenhouse gas emissions into the environment per year. Animal waste provides critically important fertilizer to small distributed farms, but in the modern massive feedlots of concentrated animal populations it becomes an environmental hazard. All the feed transported to the feedlots uses petroleum fuels, and the hay is grown using ancient “fossil water” pumped from deep, essentially non-renewable aquifers. Just three crops comprise 71% of U.S. crop acres: corn, soybean, and wheat. Monsanto, Pioneer, and Syngenta — all basically chemical companies — dominate the seed industry with patented GMO seeds. Those seeds are finely tuned to the temperature, rainfall, and so on of the recent past, making climate change a major threat to the whole food regime (more on that here). Likewise, a handful of giant companies now control the vast majority of the food supply system — a stark contrast to the millions of small family farmers who dominated it prior to the 1960s. Nearly all of the food delivery system uses just-in-time inventory methods, so there is only one to three days’ supply at any point in the distribution chain. In short, Bradford explained, we have built a complex food supply system with very low diversity and strong connectivity. Yet in nature, those characteristics lead to instability. Stable systems are highly diverse with weak connectivity. The very complexity and interconnectedness of our food web is, in itself, a dangerous vulnerability. Bradford aptly compared our blithe faith in the food supply system to “the hubris of Wile E. Coyote” just before he realizes he’s about to plunge into the canyon. A presentation by Michael Webber of the University of Texas at Austin emphasized another important interrelationship: We use water for energy, and energy for water. Nearly all power plants are thermoelectric heat engines — they use heat to produce electricity (the notable exceptions to this are hydro power and solar photovoltaics). Although there are many variations of the process, here’s a simple explanation: A source of heat is applied to one side of the engine, which causes the expansion of a gas. The expansion of the gas makes a turbine spin, generating electrical power. The heat is then dumped by the cold side of the engine, which causes the gas to condense again. Water is typically used to remove the heat on the cold side. Air-cooled plants are also possible, but they are less efficient because they’re less cold, and so water-cooled plants are far more common. It should come as no surprise, then, that the largest user of water in the U.S. is the thermoelectric power sector, accounting for 48% of the total water withdrawal and 39% of freshwater withdrawals. The first vulnerability of the energy-water relationship is what happens when insufficient (or insufficiently cold) water is available: It forces power plants to scale back, or shut down altogether, which has happened at numerous coal- and nuclear-fired plants around the world over the last few years. Webber believes that droughts could even close nuclear power plants in the Southeast permanently due to limited water. On the flip side, Webber noted that roughly 10% of electricity in the U.S. is used for waste and wastewater, including end uses. But in denser, larger states the energy load can be much higher. According to a 2005 study by the California Energy Commission, fully 19% of the state’s energy use is related to pumping, treating, transporting, heating, cooling, and recycling water. The energy-water nexus includes liquid fuels as well as electricity. Net energy researcher David Murphy noted at the conference that the EROWI (energy returned on water invested) is 228 for petroleum diesel, but only 0.024 for corn ethanol, because making it requires massive amounts of water. Producing liquid fuels from low-grade resources like tar sands and oil shale also requires enormous amounts of water to produce steam and fracture shale. Vince Matthews, the director of the Colorado Geological Survey, expressed his doubts at the conference that his state’s shale resources would be developed because of the water dependency. The “head” of the state’s water supply is dropping by about 30 feet per year, he said, and has been falling for 20 years. He expects it to hit the aquifer around 2011. Finally, we must not forget that most of the Middle East is investing heavily in the desalination of seawater to provide adequate fresh water for its burgeoning population (and of course, its indoor ski slopes). Desalination requires over 9,800 kWh per million gallons, according to Webber. I can easily imagine desalination becoming a major factor in the declining oil exports from the Middle East. On the energy-water nexus, Webber made two important conclusions: first, we need to rethink transportation; and second, water conservation and energy conservation are synonymous. Gail Tverberg, energy analyst and editor of The Oil Drum, discussed the financial side of complexity in her presentation, describing the economy as a highly-networked system of great interdependence: manufacturing depends on international trade; businesses depend on credit, manufactured goods, and electricity; electric utilities depend on credit and on replacements parts, and so on. There is a systemic risk in highly-networked, interdependent systems she said, like a computer crash: one thing stops working, and everything else stops working. International trade and finance and credit, for example, are closely linked with oil extraction. It’s not coincidental that consumer credit peaked in July 2008, just as oil production peaked. . .
Credit enables oil production, and also enables demand for oil, by allowing consumers to buy things made with and from oil. Conversely, shrinking oil supplies limit economic growth, leading to the kind of defaults we saw this past year. When banks cut back on lending, it leads to less supply and less demand. The net impact of credit on oil is that it provides positive reinforcement for oil extraction when it’s growing, and negative reinforcement on the way down. Peak oil equals peak credit, and peak credit equals peak oil. 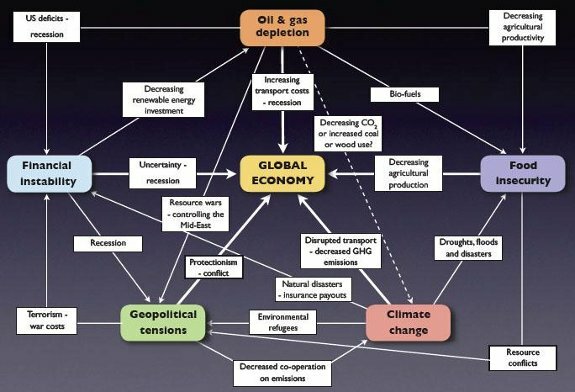 Therefore, Tverberg concluded, our complex systems’ vulnerabilities to peak oil extend far beyond mere fuel supply. Our current model of food production may cease to work. Our current model of transportation may cease to work. Globalization will fail without ample cheap liquid fuels, making re-localization a necessity. And ultimately, without all complex systems we take for granted today, we will likely be forced to accept a much lower standard of living. Just reading a chart like that makes you want to turn away and latch onto a simpler view, doesn’t it? Well, keep that in mind and we’ll return to it in a moment. The problem with complex systems of course is that they’re. . . well, complex. No one can model demand accurately, and no one predicted that oil would hit $147 and $33 in a span of six months last year. No one has a good model for the feedback loop from GDP to oil demand, oil demand to price, price to supply, and supply to GDP — let alone the influence of new Frankenstein financial instruments and monetary policy. No one seems to recognize that although the population growth curve led the energy curve on the way up, energy will lead population on the way down. Even the historical data is all from an era of constantly growing energy supply, making it a poor guide to the future. A quick aside: In a presentation to the World Future Society annual conference this year, David Pearce Snyder, an editor of The Futurist magazine, argued that schools are not equipping students with the necessary skills to deal with complexity, and that new curricula are essential to surviving the modern world. I agree completely. So how can retail investors navigate this increasingly complex and chaotic world? My guiding lights here include the likes of E. F. Schumacher, Paul Erlich, Paul Hawken, and Thomas Malthus — they were right, if a little (or a lot) early. And of course Henry David Thoreau, who exhorted us to simplify. They would tell us to focus on simplicity in our investing strategies: Think locally, not globally. Small and distributed is more resilient (and more beautiful) than big and centralized. Using less energy to accomplish the same thing will succeed over trying to produce more energy. Imitating nature’s low-energy, low-impact, non-toxic methods in our industrial activities — a study now known as biomimicry — will succeed over inventing wacky new chemicals that nature has never seen before. From now on, we should let the K.I.S.S. principle be our guide: Keep It Simple, Stupid. Editor’s Note: This article is Part 4 of a series of Chris’s reports from the 2009 ASPO Peak Oil Conference. See also Part 1, Part 2, and Part 3. Energy analyst Chris Nelder offers an initial report from the annual ASPO-USA peak oil conference, updating the numbers on supply, demand, peak and the current outlook for oil and gas. Can Renewables Replace Fossil Fuels? Energy analyst Chris Nelder explains why oil prices may be trapped in a tight range, and why that’s good for cleantech investors. Great piece as always. The systemic nature of our resource challenges isn’t considered enough when the media and leaders talk about managing energy, food and water and other resources. This article brings it into focus nicely. Small and distributed is also more secure and stable.